Unholy Baptism are a band from Arizona that plays a very diverse and satanic form of black metal and this is a review of their self released 2017 album "On The Precipice Of The Ancient Abyss". Wind sounds start off the album before going into a heavier direction which also uses a great amount of dark sounding melodies while you can also hear all of the musical instruments that are present on this recording and the slower riffing is very heavily influenced by doom metal. Vocals are mostly grim yet high pitched black metal screams and when the music speeds up a great amount of tremolo picking and blast beats can be heard which also gives the songs a more raw feeling while the guitar solos and leads are done in a very dark and melodic fashion. A great portion of the tracks are very long and epic in length and you can also hear a great amount of 90's second wave Norwegian influences in the songs while still also having some more modern ambient black metal elements and the songs also bring in a great mixture of slow, mid paced and fast parts and as the album progresses the music starts getting more depressive on some of the later tracks along with spoken word parts also being used briefly and all of the musical instruments have a very powerful sound to them. 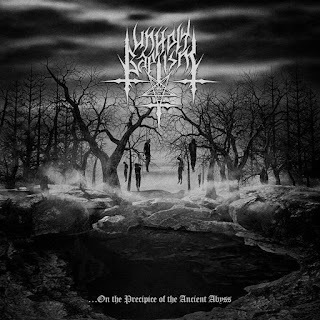 Unholy Baptism plays a style of satanic black metal that is very diverse taking the raw and old school style and mixing it in with traces of the more ambient and depressive side of the genre as well as adding in a touch of doom metal, the production sounds very dark and raw while the lyrics cover Theistic Satanism, Occultism, Medieval, H.P Lovecraft, Death and Depression themes. In my opinion Unholy Baptism are a very great sounding raw and diverse satanic black metal band and if you are a fan of this musical genre, you should check out this album. RECOMMENDED TRACKS INCLUDE "Bitter Winds(So Cold)" "Staring In The Black" "For The Glory Of Satan" and "Upon The Shadow Throne". 8/5 out of 10.